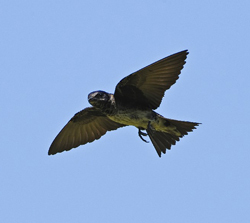 The Purple Martin is the largest swallow in North America. It is one of the earliest spring migrants in Tennessee arriving by the first of March, and can be found nesting in every county in the state. Although it nests in single cavities in western United States, east of the Rockies this species depends entirely on housing structures provided by humans. Individuals will return to the same nesting colony every year after a long migration from South America. Departing Tennessee by early September, the Purple Martin travels to the Amazon river basin in Brazil to spend our winter months. This largest North American swallow has a large head, broad, pointed wings, and a short, slightly notched tail. Juvenile: similar to female but paler on the belly, and dark gray-brown on the back. Large open or semi-open areas, especially near water. Breeds near humans where nest houses are provided. Forages for large insects in flight: including dragonflies, damselflies, flies, midges, mayflies, stinkbugs, leafhoppers, Japanese beetles, June bugs, butterflies, moths, grasshoppers, cicadas, bees, wasps, flying ants, and ballooning spiders. A collection of rich, liquid, gurgle notes given in flight. In eastern North America nests almost exclusively in birdhouses or gourds. Nest: Made of twigs, plant stems, mud, and grass. Clutch size: 1-8 white eggs. Females lay one egg per day. Incubation: 15 to 18 eggs incubated by the female. Both adults feed the nestlings, which fledge in about 28 days. After fledging, adults and juveniles gather in large communal roosts, sometimes with tens of thousands of individuals. The young continue to be dependent on their parents for food and training for an additional one to two weeks after fledging. It's not uncommon for the fledglings to return to their human-supplied housing at night to sleep during this period. •	Native Americans started the practice of providing nest structures for martins. The Choctaw and Chickasaw Indians hung hollowed calabash gourds from saplings near their homes to serve as martin houses. •	Quote by John James Audubon (1831): "Almost every country tavern has a martin box on the upper part of its sign-board; and I have observed that the handsomer the box, the better does the inn generally prove to be." •	The Purple Martin not only gets all its food in flight, it gets all its water that way too. It skims the surface of a pond and scoops up the water with its lower bill. 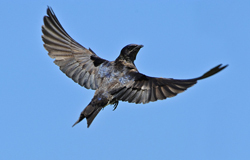 •	The oldest known Purple Martin in the wild was 13 years 9 months old. Being a Purple Martin manager may require a bit more effort and skill than with other species, especially for the beginner. It is recommended that you research Purple Martins thoroughly before you embark on this enjoyable, but sometimes, challenging project. An additional excellent resource for the new Purple Martin manager is the Purple Martin Conservation Association (PMCA) website. Regardless of which box design you use (including gourds), the following recommendations should be considered. •	Compartments 7" wide and up to 12" deep that offer greater protection from predators and the elements, and will keep nestlings more comfortable. Adult martins are 8" long, so compartments must be large enough to accommodate 4-6 nearly-grown nestlings and both parents. •	Crescent shaped entrance holes help prevent problems with starlings and should measure 3" wide and 13/16" tall. These entrances should be positioned no higher than 1/2" above the porch or floor, or can be mounted flush with floor. •	Housing should have door plugs to prevent occupation by other birds during the non-breeding season. •	Be sure your Purple Martin house can be easily lowered and raised. Some wooden houses are very attractive but also very heavy and can be difficult to manipulate. The best types have pulley systems that raise and lower the house vertically while the pole remains fixed. Winch and pulley systems should be oiled regularly and rope and cables should be checked routinely for signs of wear. Frayed rope or cable should be replaced. Martin houses should be placed in an open location, at least 40 ft. from trees or buildings. Martins prefer to have clear access to houses from all sides, and like to have perching sites like utility wires nearby, but not attached to the nest box. The height of the housing can be anywhere from 12-20 ft. Keep tall bushes, shrubs, and vines away from the pole. If your yard has too many trees near the box, relocate it to a more open area, mount it higher, or remove trees to create a more open site. If you live near a body of water, boat docks make ideal locations for mounting a martin house or gourd rack. Set the pole in concrete, with 18-25" below the ground, to provide a strong base for a new box system. A cone-shaped predator guard placed on the pole will protect the birds from snakes, raccoons and other mammals. The top of the pole guard should be placed at least 4' above the ground. Even with deep compartments, PMCA recommends that you equip your house with an external owl guard. If commercial guards are not available, you can fasten hardware cloth (2" x 4" mesh) to the outside of the house, creating a protective cage that can be removed for nest checks and monitoring. We recommend ensuring that the house is open and cleaned out before the first martins return in early March in Tennessee. 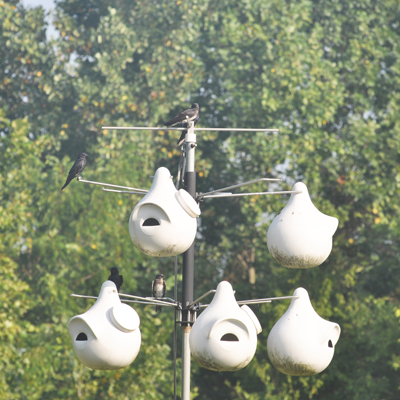 Until you have an established Purple Martin population, controlling nest-site competitors may require repeatedly lowering the housing to remove nests of competitors like House Sparrows and European Starlings. When monitoring the nesting box(es), check for evidence of predation on the ground under the housing (dropped owl feathers, plucked martin feathers, chewed-off martin wings, etc.). We recommend NOT checking on the status of eggs and nestlings during the nesting season as different pairs of birds are often in different stages of the nesting cycle. Some birds may have eggs while others have young nearly ready to fledge. Disturbance at the wrong time could have negative results for many nests. Some weather conditions may contribute to a large increase in the population of external parasites normally found in martin nests, including fleas, nest mites, and blowfly larvae. The safest way to reduce the number of nest parasites is to conduct a "nest replacement." See PMCA web for detailed instructions. Never use pesticides in nests or boxes. Your Martin house can be cleaned out after the birds leave in September. We recommend blocking the holes with plugs to prevent House Sparrows and other birds from roosting in or nesting before martins return.